This generation has long been recognised as that of remasters, and for good reason. If there’s a game that has gained even a little popularity amongst players, then chances are it either already has, or soon will, receive a remastered version. It doesn’t matter if it’s a year old, or twenty years old either as in recent times there are very few classic titles left for us to see that aren’t at least being talked about for a fresh release on current platforms. 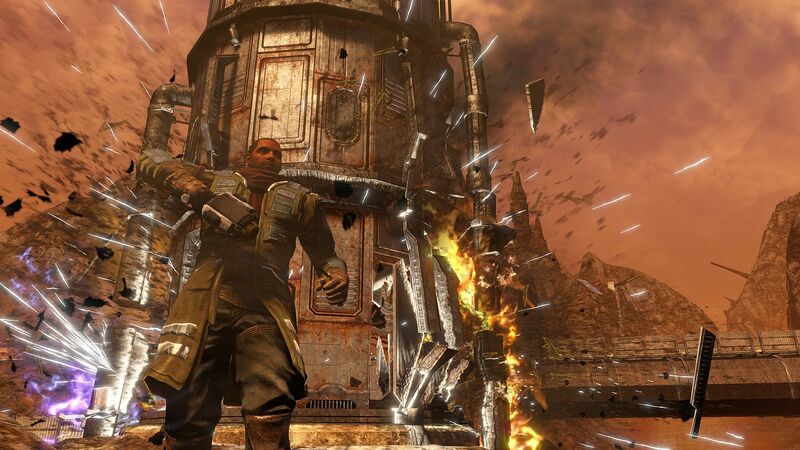 The latest joining that long list of remasters is Red Faction Guerrilla, which for many is arguably the best title in the highly underrated Red Faction series. But what changes does it bring with its arrival in the form of Red Faction Guerrilla Re-Mars-tered? For those who haven’t previously had the chance to enjoy the delights of levelling almost every building you come across with a sledgehammer since Red Faction Guerrilla first arrived back in 2009, let me tell you about the narrative experience you can expect to find. The story drops you into the role of Alec Mason, a man whose ventures have taken him to Mars as he looks to find work in the mining industry on the red planet alongside his brother Daniel. After Daniel is relentlessly gunned down in front of him by the EDF (Earth Defence Force), Alec’s main objective quickly changes and with the EDF oppressing and colonizing the people of Mars, he joins in with the actions of the rebellious Red Faction to overthrow them once and for all. Back in 2009, many were quick to applaud Red Faction Guerrilla. It was fun, it was expansive, and it was a rather fantastic addition to an already enjoyable series, complementing the two great titles coming before it. Gameplay wise it has plenty for players to get stuck into, with them able to freely roam the open-world environment of Mars from a third-person perspective, taking on missions, side activities, and exploring every nook and cranny of the distant murky planet. Much of the enjoyment however comes from the destruction, with almost any building capable of being absolutely demolished, with some of the most satisfying destruction physics we’ve ever seen. In this Re-Mars-tered version, the building destruction is still the incredible highlight, along with the same great story that many enjoyed before. 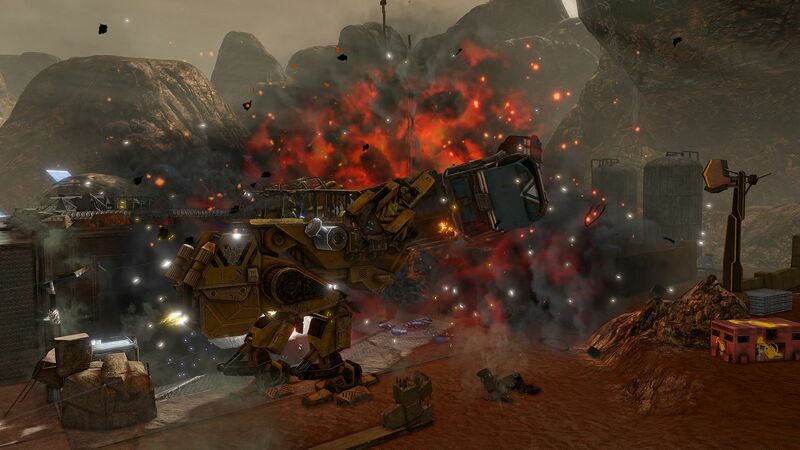 Unfortunately, though, things have very much moved on since 2009, and with visuals now closing in on the realms of photorealism, colours now more vibrant than ever, and consoles that are pushing the technical boundaries of every title to the limits, Red Faction doesn’t quite look or feel as great as it did back in 2009. As someone who doesn’t really pay all that much attention to visuals and is just as happy to play an 8-bit title as I am the latest 4K masterclass, it doesn’t bode well when one of the first things I’m able to pick up on are the horrible textures that are spread throughout. We must consider that this is of course nine years old now, but that doesn’t mean the many rocky mountainsides should resemble cardboard better than they resemble mountains, or that the buildings should just pop up from out of nowhere as you get closer to them – especially when you consider the power available with the modern consoles. Another issue comes within the cutscenes, with multiple occasions seeing characters faces appearing rather blurry. As for the gameplay itself and Red Faction Guerrilla is still just as much fun as it always has been. The destruction still proves a feature to marvel at as each and every last brick plays a part in a building’s demise, and with the majority of missions involving building destruction of some kind, there is always going to be some mayhem to cause… and some fun to be had. Whilst many will want to spend the majority of their time swinging the sledgehammer at everything in sight however, Red Faction Guerrilla is in actual fact a third-person shooter, and with a multitude of different weapons available, it’s fair to say there is certainly enough variety to keep you going for some time. The gunplay isn’t bad either and even though enemies can at times take a fair few bullets to down, a few well placed headshots can often do the trick just fine. The only complaint to be found within the gameplay side of things is just how little variety is involved in the side missions, with only a handful of different objectives spread throughout each of the many activities. This certainly isn’t a massive issue due to the enjoyable nature of the destruction within the game, however it would have been nice to at least see something a little fresh after several hours. The same old missions in a different location just don’t really cut it. Of course, being a remaster – or a re-MARS-ter as the clever word play indicates – you can expect to find additional content included. See, besides the main game, players can also get stuck in with the Multiplayer, Wrecking Crew and a Bonus Mission – the Demons Of The Badlands. Those wanting to try out the Multiplayer side of things will find plenty of different options available with seven different playlists that include multiples modes, including Anarchy and Bagman, as well as their Team variants – Team Objective, Siege and Large Mixer. These game modes are still just as enjoyable as they were first time around with Capture the Flag proving a personal favourite. As for Wrecking Crew, this sees players taking part in six distinct modes, all of which task them with causing as much destruction as possible, usually within a given time limit. 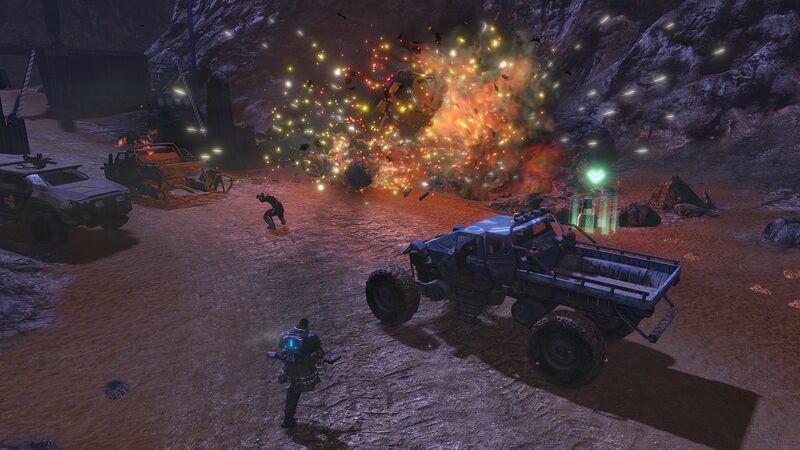 This mode truly showcases the amazing destruction that is capable within Red Faction Guerrilla, something that would even put Just Cause to shame. Finally, we have the Demons Of The Badland DLC prequel mission that lets you step into the shoes of Samanya, a member of the Marauders whose job is to lead the Marauder revolt after the EDF torched and defiled their home of Mariner Valley. The DLC is an interesting mission, but there’s no real replayability. It does provide a decent extension to the overall story however and with some great storytelling involved, that’s never a bad thing. It’s nice to see Red Faction return once more, but this is not a remaster that will go down as being a quality experience. 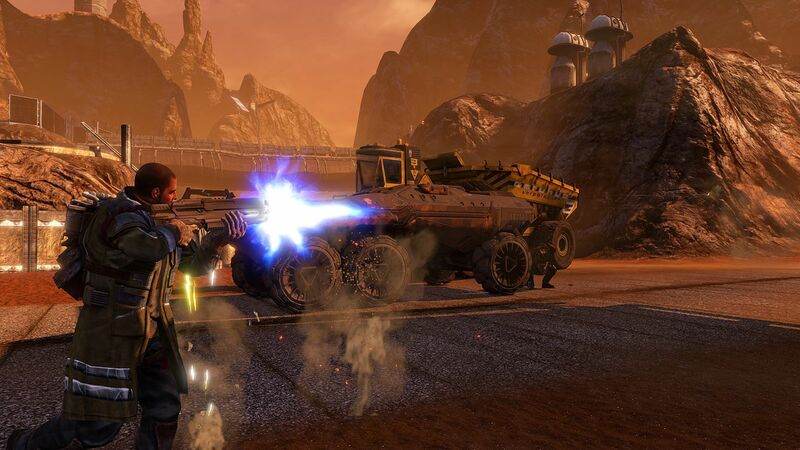 Sure, the gameplay is still as fun as it always was, but with poor visuals – even after some slight upgrades – and nothing new to speak of, Red Faction Guerrilla Re-Mars-tered is something many of us could have lived without. 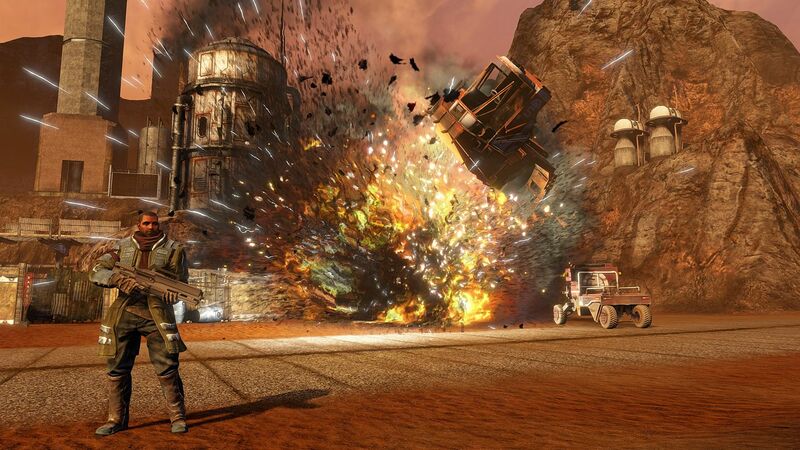 If you’ve yet to play Red Faction Guerrilla then by all means jump in, but if you’ve enjoyed it once already, there’s no need to head back for a second helping.